A hunting trip to Åland offers fine hunting adventures and mighty nature experiences; enjoy the beautiful autumn landscape and the excitement and fulfilment of great hunting luck in the company of friends. Hunting in Åland takes place in a diversified terrain where dense forests are mixed with open areas and flatlands with hillier terrain. Here you’ll get the chance to try your skills under all possible conditions. Thanks to the short distances in Åland you can also quickly move between different hunting areas. There are especially many roe deer on the islands. Roe deer are therefore counted as the main prey. Additionally you can hunt seabirds in autumn in Åland. In Åland there are many chances for hunting luck thanks to the many roe deer. There are approximately 15,000 roe deer on the islands and some 4,000 are shot yearly. Choose between hunting with dogs or hunting from a tower. To create the best conditions for a successful hunt, there will always be a skilled hunting guide with you. Now it’s also possible to hunt roe deer with bow and arrow in Åland. 1 October – 31 December: hunting for roe deer with dogs. Either with your own dog or with a local dog driver. Remember to check the current quarantine regulations before you bring your own dog. In autumn it’s time for sea bird hunting in Åland. The sea bird hunting was especially important for the archipelago life in the past. Nowadays you can follow along to the smaller islands and experience the old traditions yourself. Together with your hunting host you can hunt sea birds such as Common goldeneye and Tufted duck with the help of decoys. – For most of our guests just to come out in the archipelago is an experience – but to also hunt on nature’s terms makes the experience even bigger, says the hunting host Mikael Lindholm. 1 September – 31 December: hunting for Mallard, Northern shovelers, wigeon, Northern Pintail, Common goldeneye, Tufted duck, Pochard, Long-tailed duck, Common Merganser, Red-breasted Merganser, European Woodcock, Woodpigeon, Black Grouse and Pheasant. 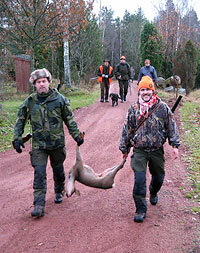 To get a permission to hunt in Åland you need an Åland hunting license. The prerequisite for a hunting card in Åland is that you have a valid hunting exam and license for weapons in your home country. The card is 35 Euro and is valid for a whole hunting year, from August 1st to July 31st the following year. Included in the yearly fee there is also liability insurance, accident insurance and a subscription to the magazine “Jägaren” (in Swedish). At least two weeks before your trip, you need to apply for a hunting card by submitting a proof of hunting exam to the Åland government “Landskapsregeringen” by e-mail to katarina.lindqvist@regeringen.ax. Your hunting organiser or host can also help you with your application. Contact the hunting administrator at Landskapsregeringen’s forestry division (“skogsbruksbyrån”) by calling +358 (0)18 25000 for further information. Make sure to find out the current legislation for transport of weapons before your trip and remember to bring proof from your hunting host that you will be hunting. As a hunter you’re fully responsible for your weapons and all paperwork needed for transporting them. Because everybody has different wishes and requirements for a hunting trip, the hunting organisers in Åland and the hunting hosts, e. g. Silverskär and Svinö stugby, tailor each hunting trip so that it suits you and your team. You may also combine your hunting trip with a fishing trip. Usually the trip consists of two days with full pension and two nights, including all service from the time you arrive to Åland until you leave the islands. The 35 Euro for the hunting card in Åland and trophy fees are extra. Did you forget some of your hunting gear at home? In Mariehamn there are several hunting shops at your service.